R had fun swirling food colouring and oil drops around in milk using a q-tip. I placed a thin layer of milk (just enough to cover the bottom) in a cake pan. I added drops of food colouring into the water and then added drops of oil into the food colouring drops. R swirled the colours around. I then placed some water colour paper on top to capture her swirls as a print on paper. The printing step needs to happen shortly after starting to swirl the colours together so that the food colouring doesn’t dissolve into the water and so that the print comes out quite brightly on the paper. 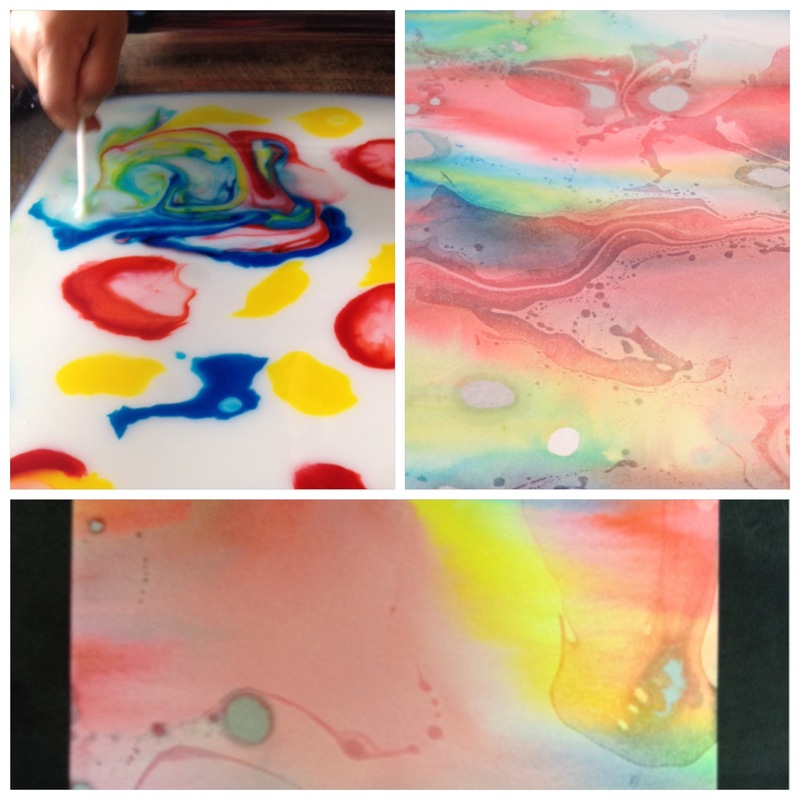 The oil is used to add the swirling effect you see in our prints! a. Use the printed paper to wrap presents for others or to use as a back ground far a special card. b. Use the printed paper to motivate kids to write! Clip the paper onto a clipboard and add it to any play area. It would make a great addition to an imaginative play area (such as a kitchen) for the kids to use to make grocery lists on or take telephone messages.